Bioplast Nose Studs - Internally Threaded Bioplast Nose Wires in Titanium, Silver and Gold. Bioplast bent and straight nose studs. We have a large range of settings including Silver and Gold. 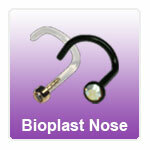 Bioplast nose studs are internally threaded.